By the turn of the millennium, the East Mediterranean region had become a place of foreigners to Latin Christians living in Western Europe. Nevertheless, in the eleventh century numerous Latin Christian pilgrims streamed toward the East and Jerusalem in anticipation of the end times. The Apocalypse did not materialize as some had anticipated, but instead over the course of the next few centuries an expansion of Latin Christendom did. This expansion would transform the political, economic, and cultural landscape of both East and West and alter the course of Mediterranean history. This volume presents 22 critical studies on this crucial period (1000-1500) in the development of the Western expansion into the Eastern Mediterranean. These works deal with economy and trade, migration and colonization, crusade and conquest, military orders, as well as religious diversity and cross-cultural interaction. It includes a bibliography of important works published in Western languages together with an introduction by the editor. Contents: Introduction; Bibliography; Part One Travel, Trade and Economy: Coastal shipping and navigation in the Mediterranean, Michel Balard; The geographical considerations of the galley navigation in the Mediterranean, John H. Pryor; Byzantine Crete in the navigation and trade networks of Venice and Genoa, David Jacoby. Part Two Migration and Colonization: The Venetians in the Black Sea: a general survey, Michael E. Martin; Italian migration and settlement in Latin Greece: the impact on the economy, David Jacoby; The Genoese in the Aegean, Michel Balard; Cyprus and the beginnings of modern sugar cane plantations and plantation slavery, Sidney M. Greenfield. Part Three The Crusades and the Christian East: The impact of the crusades on Eastern Christianity, Philip K. Hitti; The Armenian Church and the papacy at the time of the crusades, Bernard Hamilton; The Chronicle of Matthew of Edessa: apocalypse, the First Crusade and the Armenian diaspora, Christopher MacEvitt; Colonization and the creation of hospitals: the Eastern extension of Western hospitality in the 11th and 12th centuries, Monique Amouroux. Part Four Military Orders: The emergence of the military order in the 12th century, A.J. Forey; The Templars as bankers and monetary transfer between West and East in the 12th century, D.M. Metcalf; Military orders and crusader politics in the second half of the 13th century, Joshua Prawer. Part Five Cross-Cultural Encounters: The Near East on the eve of the crusades, Michael Brett; The impact of the early crusades in the Muslim world, Robert Irwin; The crusaders through Muslim eyes, Wadi Z. Haddad; Ethnic identity in the crusader states: the Frankish race and the settlement of Outremer, Allan V. Murray; Latins, Muslims and Greeks in the Latin kingdom of Jerusalem, Hans Eberhard Mayer. Part Six Trade and Crusade: Trade and crusade, 1050-1250, David Abulafia; An economic interpretation of the medieval crusades, Gary M. Anderson, Robert B. Ekelund, Jr., Robert F. Herbert and Robert D. Tollison; Papal attempts at a commercial boycott of the Muslims in the crusader period, Sophia Menache. Index. Jace Stuckey is Assistant Professor of History in the Department of History and Politics at Marymount University, USA. The 'rise of the west' is the most familiar and most elusive topic in global history. Everyone agrees it happened. No one can say how, when, where or why, without provoking dissent. Yet the world we inhabit is, by universal acknowledgement, the outcome. In recent years, controversy has focussed on the sixteenth, seventeenth and eighteenth centuries - the 'early modern period', when Western expansion became a conspicuous phenomenon in a world of colliding empires and unprecedented long-range cultural exchange. But, like most such apparently new departures in history, Western European activity in the 'expanding world' of early modernity is best understood against a background of long, sometimes faltering preparation in the Middle Ages. Therefore, following the success of the series An Expanding World, a series of key papers on the period, published by Routledge and edited by A.J.R. Russell-Wood, Ashgate has commissioned an attempt to collect cutting-edge research on the medieval background and events of European expansion. 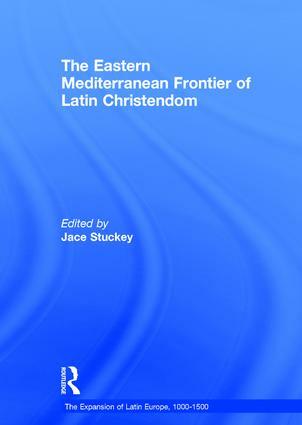 Felipe Fernandez-Armesto and James Muldoon have gathered classic and key contributions from learned journals and other arcane publications to give readers a conspectus of knowledge, analysis and reflection on the history of the frontiers, mental horizons, internal expansion and means of growth of Latin Christendom from the eleventh to the early sixteenth centuries.